Traffic flows around the Shaftesbury Memorial fountain at Piccadilly Circus in about 1955. The Bovril and Guinness advertisements had been in place for several decades when they were joined by Coca Cola shortly before this photo was taken. The film Quatermass Experiment is showing at the London Pavilion cinema. Following the Second World War it was decided to mark the centenary of the Great Exhibition with a festival of Britain’s design, industry and technology. A twenty-seven acre site was acquired on the South Bank of the Thames at Lambeth between County Hall and Waterloo. Herbert Morrison of the London County Council led an organising committee of distinguished figures. Some of Britain’s brightest designers created structures, buildings and themed pavilions. The only part intended to be permanent was the Royal Festival Hall. The Festival of Britain lasted eight months and was a great success, with eight and a half million people paying to visit during that time. Manufacturing industry experienced a boom during the First World War, as London’s many factories were kept busy producing military equipment and other wartime requirements. As German bombers targeted London’s docks and factories the reverse was true during the Second World War. For centuries London had been Britain’s leading manufacturing city but in just five years businesses were forced to move away in order to survive the onslaught. Many that departed did not return and with much of the infrastructure obliterated industry continued to migrate away from London in the 1950s. Factories and warehouses were gradually abandoned throughout the capital. 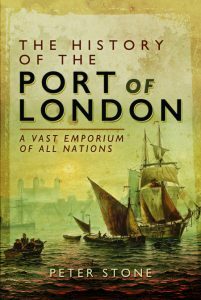 Despite the great destruction the Port of London began to function again after the war and by the early 1950s had already surpassed pre-war tonnage, aided by more efficient goods-handling. An all-time peak was reached in the early 1960s but the port’s cargo boom of the 1950s was to be short-lived. The collapse of the British Empire meant a gradual decline in trade through London. Shipping methods had also changed, with a new style of ‘roll-on, roll-off’ container cargo for which the London docks were not prepared because an inflexible workforce had prevented modernization. After the war dockers, backed by militant unions, regularly went on strike, shutting the port for weeks on end. Between 1967 and 1980 all London’s docks closed with the exception of Tilbury further down-river. The vast area of docks lay empty and derelict with the loss of twenty five thousand direct jobs. London’s main airports had been based at Croydon and Heston until civilian flights were suspended during the war but when they resumed the government decided to locate them instead at the airfield at Heathrow, which was more suitable for expansion. The new London Airport opened in 1946. Passenger numbers increased rapidly but there was a limit to how much the airport could expand, particularly in the number of runways. The old airfield at Gatwick to the south of London reopened as a commercial airport in 1958 followed by Stansted in the 1960s on a former United States Airforce base, and the old RAF base at Luton to the north about the same time. The single-runway London City airport for short-distance flights opened at the former Royal Docks to the east of the City in the 1980s. The City increasing became dominated by one industry in the second half of the century: the financial services sector. At the end of the 1950s Britain’s foreign exchange controls were relaxed and the City took on a new international role as the key centre for currencies. In the 1950s just a small number of foreign banks had branches in London but by the end of the century there were few that could not afford to, and the City could list almost six hundred. Yet probably the most significant event to boost London’s position in the world’s finances was the ‘Big Bang’ that took place in October 1986. Rules that separated different kinds of financial institutions were discontinued, allowing them the possibility to offer a full range of services to their clients. A year before Big Bang the Bank of England had relaxed the rule that banking headquarters were obliged to be located within the City. During the same decade the government created a new enterprise zone in East London leading to the new financial district of Docklands.